It sits on top of a rocky foundation, but Fallout 76 is still kicking and seems ready to go for the rest of the year. 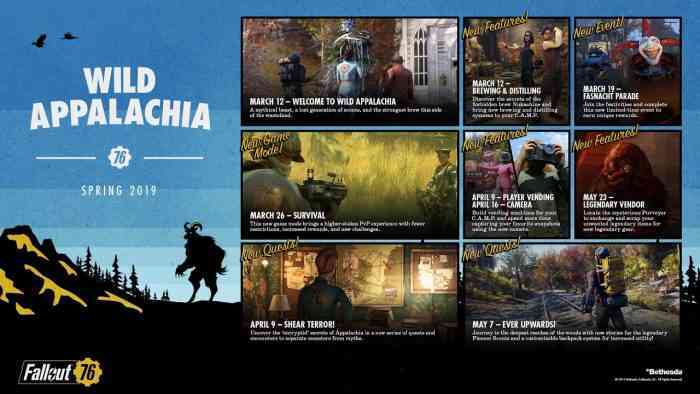 Today, Bethesda Softworks revealed their 2019 roadmap for the game’s content updates. Here’s what loyal wastelanders can look forward to. There will be a total of three major updates throughout 2019, updates that Bethesda highlighted over on their website alongside an apology for the game’s issues. The updates start in the Spring, with the all-new Wild Appalachia. It’s a new zone with new quests and features. Apparently, it’s the location of the undiscovered Nukashine brew, a place where players can potentially distill their own drinks. Players will also have access to the deeper wilds where new beasts may lurk. Through exploration, they may find the Purveyor who lets everyone scrap their old Legendary goods for new Legendary goods. Last but not least, the Wastelanders update will bring a new quest where choices matter. But of course, fans have come to expect as much from a Bethesda title. Expect new questlines, new factions, and new details as we approach the Fall season. Fallout 76 is available now on Xbox One, PlayStation 4, and PC via Bethesda Launcher.